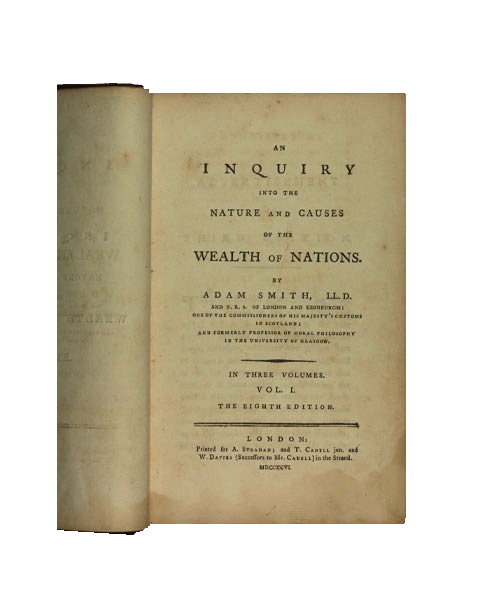 An Inquiry Into The Nature & Causes of the Wealth of Nations - Volume 1 - IFA Vintage and Current Book Library - Index Fund Advisors, Inc.
After reading the relevant chapters, you ought to be able to explain the quotes and answer the questions. Consider them as a sort of alarm system, to alert you to when you have been passing the words through your mind without extracting the ideas. "Nobody but a beggar chuses to depend chiefly upon the benevolence of his fellow-citizens. Even a beggar does not depend upon it entirely." "Among men, on the contrary, the most dissimilar geniuses are of use to one another; the different produces of their respective talents, by the general disposition to truck, barter, and exchange, being brought, as it were, into a common stock..."
"The labourer is rich or poor, is well or ill rewarded, in proportion to the real, not to the nominal price of his labour." "Labour, therefore, is the only standard by which we can compare the values of different commodities at all times and at all places." "In France a seignorage of about eight per cent is imposed upon the coinage, and the French coin, when exported, is said to return home again of its own accord." "The profits of stock, it may perhaps be thought, are only a different name for the wages of a particular sort of labour, the labour of inspection and direction. They are, however, altogether different..."
"Labour measures the value not only of that part of price which resolves itself into labour, but of that which resolves itself into rent, and of that which resolves itself into profit." "In the progress of the manufacture, not only the number of profits increase, but every subsequent profit is greater than the foregoing; because the capital from which it is derived must always be greater,"
"The real value of all the different component parts of price, It must be observed, is measured by the quantity of labour which they can, each of them, purchase or command." "In the progress of the manufacture, not only the number of profits increase, but every subsequent profit is greater than the foregoing; because the capital from which it is derived must always be greater." "The natural price, therefore, is, as it were, the central price, to which the prices of all commodities are continually gravitating." "The whole quantity of industry annually employed in order to bring any commodity to market, naturally suits itself in this manner to the effectual demand. It naturally aims at bringing always that precise quantity thither which may be sufficient to supply, and no more than supply, that demand." "The rent of the land which affords such singular and esteemed productions, like the rent of some vineyards in France of a peculiarly happy soil and situation, bears no regular proportion to the rent of other equally fertile and equally well-cultivated land in its neighbourhood." "The price of monopoly is upon every occasion the highest which can be got. The natural price, or the price of free competition, on the contrary, is the lowest which can be taken, not upon every occasion indeed, but for any considerable time altogether." "But though all things would have become cheaper in reality, in appearance many things might have become dearer than before,.."
"The increase of revenue and stock is the increase of national wealth." What is the difference between revenue and stock? "The work done by freemen comes cheaper in the end than that performed by slaves." "The liberal reward of labour, as it encourages the propagation, so it increases the industry of the common people." "The price of labour, therefore, frequently rises in cheap years." The discussion of the differences in wages and interest rates between the town and country, and between Scotland and England. "The rise of profit operates like compound interest." "Fourthly, the wages of labour vary accordingly to the small or great trust which must be reposed in the workmen." "When a great company, or even a great merchant, has twenty or thirty ships at sea they may, as it were, insure one another." Does Smith regard men as risk preferers? risk avoiders? both? neither? Does he assume that industry must have a fixed ratio of factor inputs? "Its price, therefore, besides compensating all occasional losses, must afford something like the profit of insurance." "The rent of land, therefore, considered as the price paid for the use of the land, is naturally a monopoly price." "If there had been no tax this fifth would naturally have belonged to the landlord, and many mines might have been wrought which could not then be wrought, because they could not afford this tax." "The tax of the Duke of Cornwall upon tin is supposed to amount to more than five percent, or one twentieth part of the value; and whatever may be his proportion, it would naturally, too, belong to the proprietor of the mine, if tin was duty free." Is there an inconsistency here? "The rent of the cultivated land, of which the produce is human food, regulates the rent of the greater part of other cultivated land." "The price both of the precious metals and of the precious stones is regulated all over the world by their price at the most fertile mine in it"
"The value of the most barren lands is not diminished by the neighborhood of the most fertile. On the contrary, it is generally increased by it." "China is a much richer country than any part of Europe, ... the real recompense of labour is higher in Europe than in China." "This, however, is the effect, not of the real cheapness of silver, but of the real dearness of corn." "But though very much defaced, its value has been kept up by that of the gold coin for which it is exchanged." "Whatever regulations tend to sink the price either of wool or of raw hides below what it naturally would be must, in an improved and cultivated country, have some tendency to raise the price of butcher's meat." "All those improvements in the productive powers of labour, which tend directly to reduce the real price of manufactures, tend indirectly to raise the real rent of land." "The interest of this third order, therefore, has not the same conection with the general interest of the society as that of the other two." Chapter 1: "The stock that is laid out in a house, if it is to be the dwelling- house of the proprietor, ceases from that moment to serve in the function of a capital..."
"It is the produce of land which draws the fish from the waters..."
Chapter 2: "The price of that labor may indeed ....But in other sorts of labor, both the price and the produce go to this stock..."
"But though the whole expense of maintaining the fixed capital is thus necessarily excluded from the net revenue of the society, it is not the same case with that of maintaining the circulating capital." "Money, therefore, is the only part of the circulating capital of society, of which the maintenance can occasion any diminution in their net revenue." "...must increase the fund which puts industry into motion, and consequently the annual produce of land and labour, the real revenue of every society." "But as the quantity of gold and silver, which is taken from the currency, is always equal to the quantity of paper which is added to it, paper money does not necessarily increase the quantity of the whole currency." "Second, by this attention they secured themselves from the possibility of issuing more paper money than what the circulation of the country could easily absorb and employ." "What is annually saved is as regularly consumed as what is annually spent,.."
Chapter 4: What assumptions go into Smith's support for maximum interest rates? Chapter 5: The discussion of the relative productivity of the four ways of employing capital. General: The concept of productive vs unproductive labor and the meaning of references to one capital "replacing" another, especially in chapter 5. "By preferring the support of domestic to that of foreign industry he intends only his own security; and by directing that industry in such a manner as its produce may be of the greatest value, he intends only his own gain, and he is in this, as in many other cases, led by an invisible hand to promote an end which was no part of his intention." Can this; argument be made rigorous within Smith's system, i.e. can it be shown that the incentives are of the proper magnitude as well as the proper sign? Consider in particular the foreign vs domestic industry argunent. "By means of such regulations, indeed, a particular manufacture may sometimes be acquired sooner than it could have been otherwise...to find out their narural employments,"
(Infant industry argument refuted), Is this correct? Critique. "The high price of lean cattle, by augmenting the value of uncultivated land, is like a bounty against improvement"
"But as the bounty upon corn occasions a greater exportation in years of plenty, so it must of consequence occasion a greater importation in years of scarcity than in the actual state of tillage would otherwise take place." T or F? Note that what he means by "in the actual state of tillage" is "output held constant." "This second limitation of the freedom of trade,..but in spite of them" (five paragraphs). Is Smith right? Can you express his argument differently? "The Ingenious and well-informed author: of ..,(the whole paragraph)" Is Smith right? Is Smith's argument showing that the bounty on export of corm must raise its domestic price correct? Is the conclusion correct? "When you dam up a stream of water, as soon as the dam is full, as much water must run over the dam-head as if there was no dam at all." "The cheapness of gold and silver, or, what is the same thing, the dearness of all commodities, which is the necessary effect of this redundancy of the precious metal discourages both the agriculture and manufactures of Spain and Portugal, ..and thereby give (other) countries a double advantage in their commerce with Spain and Portugal," Analyse the argument-it is in part false. "The nature of things has stamped upon corn a real value, which cannot be altered by merely altering its money price." Is it possible that the combination of bounties on production and export subsidies which Smith describes~ (for Herring),could actually raise the domestic price, as Smith suggests. "This law (prohibiting middlemen in the grain industry), therefore, necessarily obstructed the improvement of the land, and, instead of tending to render corn cheaper, must have tended to render it scarcer, and therefore,dearer, than it would otherwise have been." "That rise in the real value of silver, therefore, which is the effect of lowering the average money price of corn, tends to enlarge the greatest and most important market for corn, and thereby to encourage, instead of discouraging its growth." "The price of tobacco might, and probably would, by this time have fallen somewhat lower than at present." "But this revulsion of capital, as it must have gradually increased the competition of capitals in the colony trade, so...,and somewhat higher, than that at which they had been before." "The most advantageous employment of any capital to the country to which it belongs, is that which maintains there the greatest quantity of productive labour, and increases the most the annual produce of the land and labour of that country." "The monopoly, therefore, hurts the interest of the landlord two different ways, by retarding the natural increase, first, of his rent, and, secondly, of the price which he would get for his land, in proportion to the rent which it affords." "Monopolies of the second kind may sometimes attract stock towards the particular trade in which they are established, and sometimes repel it from that trade, according to different circumstances." Chapter 1, Part I "The number of those who can go to war, in proportion to the whole number of the people, is necessarily much smaller in a civilised than in a rude state of society." "The invention of firearms, an invention which at first sight appears to be so pernicious, is certainly favourable, both to the permanency and to the extension of civilisation." 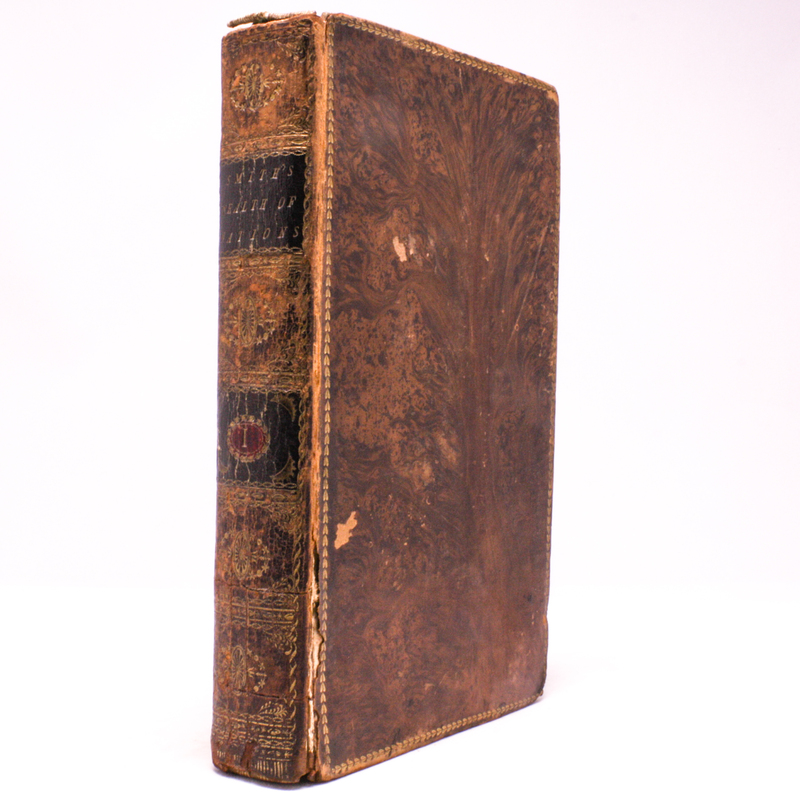 Part III, article I "In all trades, the regular established traders, even though not incorporated, naturally combine to raise profits, which are noway so likely to be kept, at all times, down to their proper level, as by the occasional competition of speculative adventurers." "The increase of demand, besides, though in the beginning it may sometimes raise the price of goods, never fails to lower it in the long run." Article II "Were the students upon such charitable foundations left free to choose what college they liked best, such liberty might perhaps contribute to excite some emulation among different colleges." What is such a scheme, for the public schools, now called? Is Smith for or against state support of education? Chapter II, Part I: "If the land which, in one state of cultivation, affords a revenue of ten millions sterling a year, would in another afford a rent of twenty millions; the rent being, in both cases, supposed a third part of the produce, the revenue of the proprietors would be less than it otherwise might be, by ten millions a year only; but the revenue of the great body of the people would be less than it otherwise might be, by thirty millions a year, deducting only what would be necessary for seed." Is this supposition reasonable? "The revenue which, in any civilised monarchy, the crown derives from the crown lands, though it appears to cost nothing to individuals, in reality costs more to the society than perhaps any other equal revenue which the crown enjoys." Part II, article I "... and though vexation is not, strictly speaking, expense, it is certainly equivalent to the expense at which every man would be willing to redeem himself from it." "Even this objection might, perhaps, be obviated, by allowing the landlord, before he began his improvement, to ascertain, in conjunction with the officers of revenue, the actual value of his lands, according to the equitable arbitration of a certain number of landlords and farmers in the neighbourhood, equally chosen by both parties; and by rating him, according to this valuation, for such anumber of years as might be fully sufficient for his complete indemnification." "The tithe, and every other land-tax of this kind under the appearance of perfect equality, are very unequal taxes;"
"A tax upon house rent, payable by the tenant, and proportioned to the whole rent of each house, could not, for any considerable time at least, affect the building-rent." "The ground-rents of uninhabited houses ought to pay no tax." "A tax of this kind, imposed during the currency of a lease, may, no doubt, distress or ruin the farmer. Upon the renewal of the lease, it must always fall upon the landlord." "Taxes upon the transference of property from the dead to the living,"
"In all cases, a direct tax upon the wages of labour must, in the long-run, occasion both a greater reduction in the rent of land, and a greater rise in the price of manufactured goods than would have followed from the proper assessment of a sum equal to the produce of the tax, partly upon the rent of land, and partly upon consumable commodities." "The emoluments of offices are not, like those of trades and professions, regulated by the free competition of the market, and do not, therefore, always bear a just proportion to what the nature of the employment requires. They are, perhap, in most countries, higher than it requires; the persons who have the administration of government being generally disposed to regard both themselves and their immedieate dependants, rather more than enough. The emoluments of offices, therefore, can, in most cases, very well bear to be taxed."